One of my long overdue projects is to reuse a couple of linear CCD sensors from old flat bed scanners. 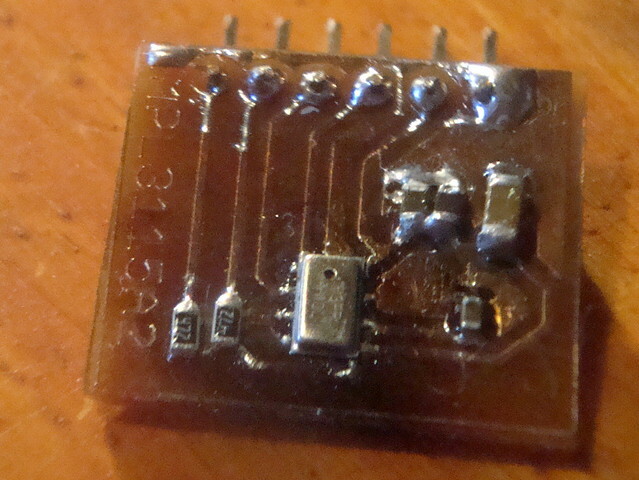 This post is just the process of reverse engineer one of the pcb boards. The CCD sensors doesn’t have any kind of markins on top, which is kind of obvious…you don’t wont to cover the sensor. 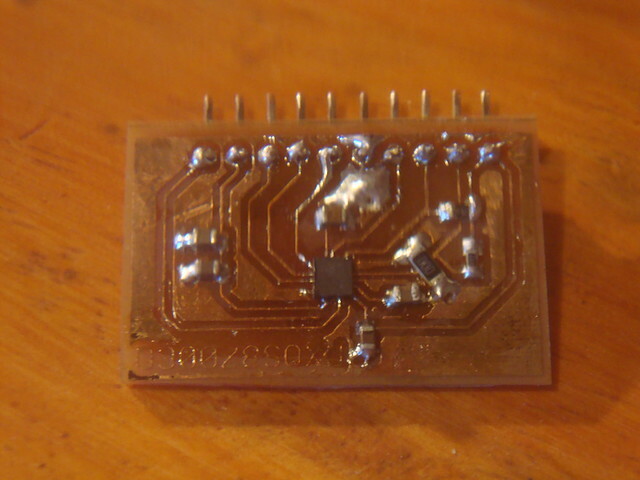 I wasn’t very familiar with this kind of devices and with a quick googling around I found out that this kind of chips have the name underneath the package (oh, duhhh…) but I wasn’t comfortable desoldering the sensor, I was afraid I could damage it through the process. I kept on looking for CCD images until I found one that looked like the one I have. It was an ILX524KA and the photo was from an ebay listing. Google image search of CCD sensors with one quite similar to the one I have (red arrow). The sensor is a Sony “reduction type CCD linear sensor developed for color image scanner”. I looked up for the datasheet and compared the pinout (mainly Vdd, GND and No Connection pins) with the board I have but unfortunately it was different. But with all that searching I found out that Sony has several of this ILXxxx CCDs so I went through a few of this devices datasheets. The ILX518 and ILX718 have a different package. The ILX724 has the same pinout as the ILX524, so this wasn’t either. Finally I found one which seems to be the one I have, the ILX548K; a reduction type CCD linear sensor developed for color image scanner, capable of reading A4-size documents at a density of 600DPI and with 16020 pixels (5340 pixels for each color row). The datasheet has an application circuit with the CCD sensor, three transistors, a 74AC04 (six NOT gates) and a bunch of passives components. The board I have has the transistors (PMSS3904) and the passives components used for signal conditioning the analog RGB outputs but it has a 74HC86 (four X-ORs) instead of the inverters. To see how the circuit was implemented and to find out how to hook up a microcontroller to the PCB connector I decided to try to reverse engineer the PCB. It isn’t a very complicated board but it was the first time I tried to do this so it was a nice little exercise. I took photos of the board and used GIMP to align both sides of the PCB, after some spinning, mirroring, resizing and making transparent one of the sides. Pretty much the entire circuit was traced out only by visual inspection (as I said, it is not a very complicated PCB) and a few connection needed the use of a multimeter. It doesn’t have some of the power stuff and the infrared sensor section. I still have the controller PCB. 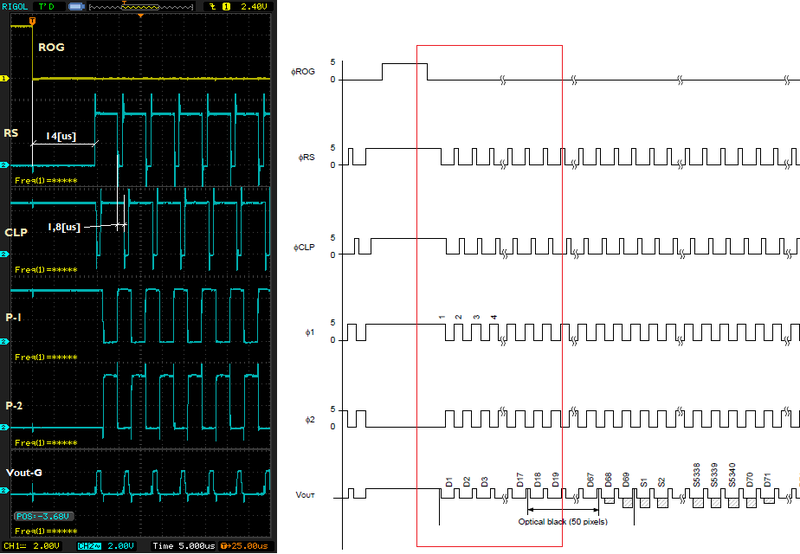 I powered both boards and hooked up my oscilloscope to see If I could find any signal. Luckily the controller board was working and it showed activity even though the board itself wasn’t connected to a PC (It used a parallel port). There were a lot of interesting signals but I only have a 2 channel osciloscope, so I used one channel as a reference (ROG) and with the other channel I probed the rest of the signals. 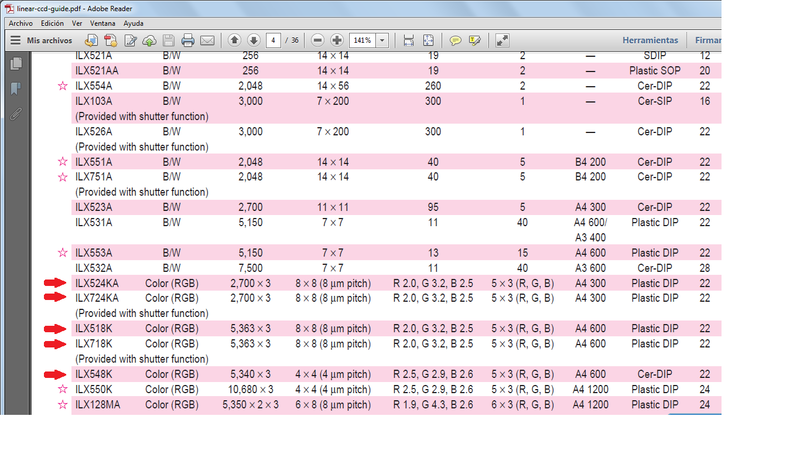 I then stitched the images together and got something that resemble the graphs in the datasheet. It seems that RS and CLP are inverted. 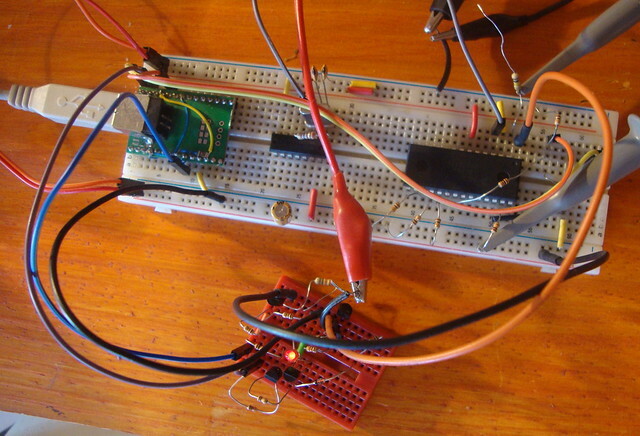 The circuit in the datasheet uses inverters to drive the pins so I thought I probed the signal before the NOT-gate. 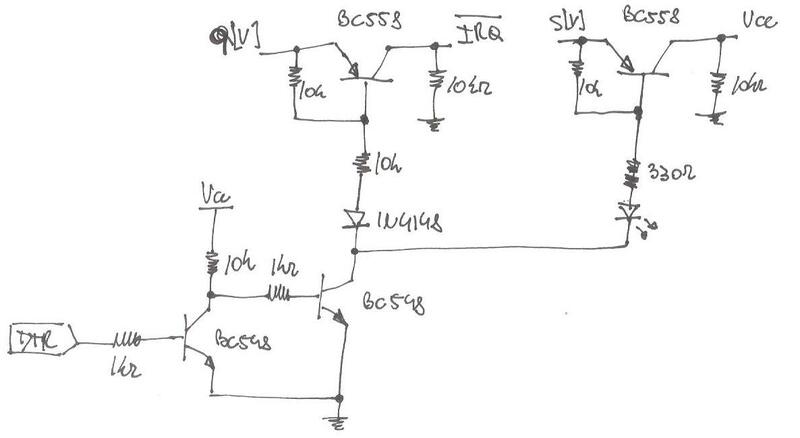 The thing is my board doesn’t use inverters it uses an XOR gate but I don’t see how this could be doing the level inversion. In the photo-sensitive area of each pixel, light is converted into electrons that are collected in a semiconductor “bucket.” The signal must move out of the photosensitive area of the chip, and eventually off the chip itself. In a one-dimensional type CCD the charge is collected in an adjacent storage gate. The signal charge is then transferred to the horizontal shift register simultaneously for all pixels. To move the charges the ΦROG signals are used. In a 2-phase CCD, the signal charge (the “buckets”) is transferred by applying two clock pulses with different voltage levels (high and low level). Φ1 and Φ2 serves for this purpose. The accumulated charge must be output as a voltage signal. The result of charge-to-voltage conversion is a very weak voltage that must be made strong before it can be handed off to the sensor. The most popular method for detecting the signal charge of a CCD is the Floating Diffusion Amplifier. It consist of two MOSFETs, one for reset and the other one for charge-to-voltage conversion. 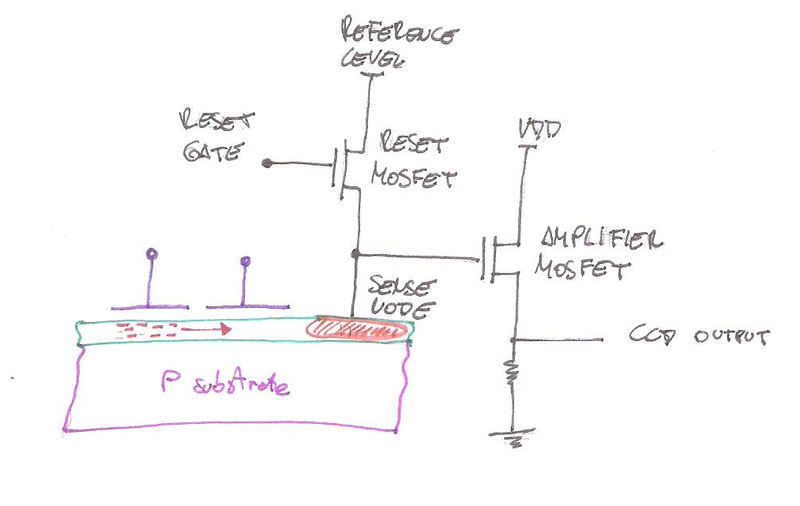 The charge transferred to the detection node is converted into a voltage by the amplifier MOSFET via the relation Q=CV. 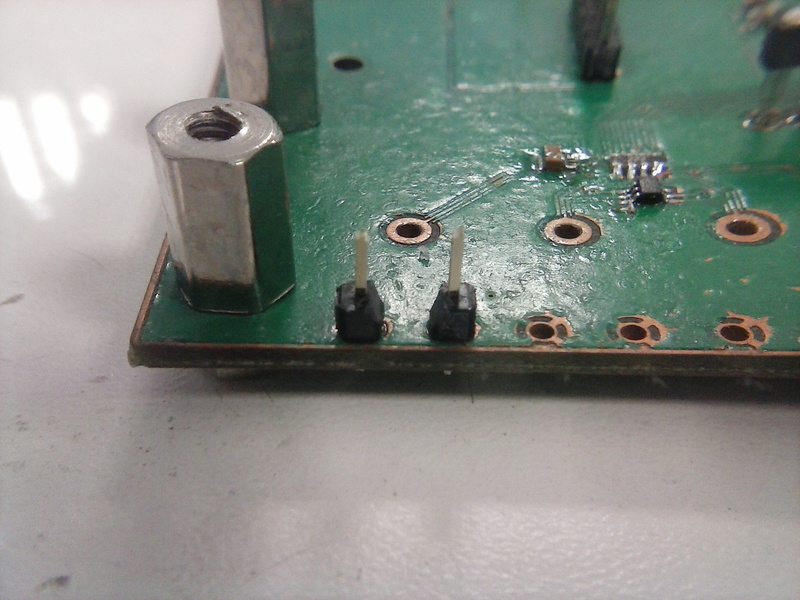 To prepare for the next signal charge (againg, the next “bucket”), the floating diffusion is first drained of the previous charge using the reset MOSFET. This reset or zero signal level is converted to a voltage and immediately seen off chip which is processed as a reference level. The charge is then shifted from the last phase within the CCD and dumped onto the floating diffusion. The resulting change in potential is converted into a voltage and sensed off chip. The difference between the reference or reset level and the potential shift of the floating diffusion level determines the signal. The ΦRS signal is used to reset the charge. Even after reset, some charge always remains in the floating diffusion storage region. 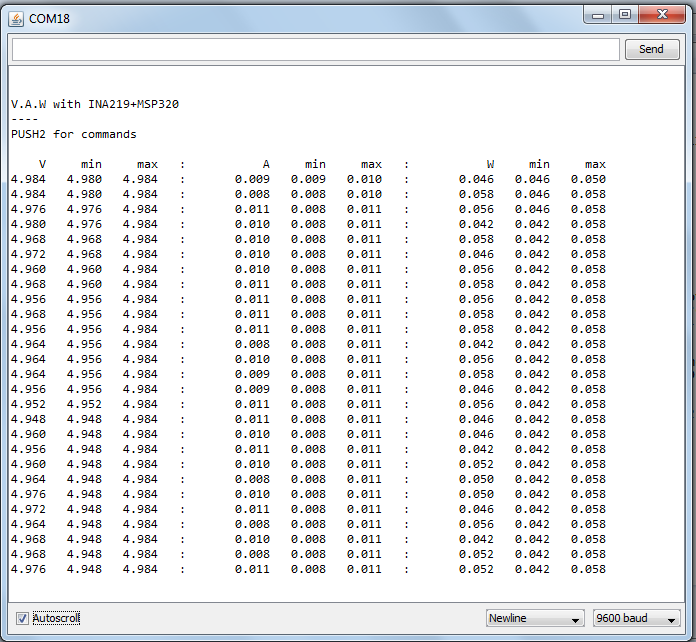 This remaining charge represents noise and is eliminated using a method called CDS (Correlated Double Sampling). The output is clamped to a known voltage, some of the references talk about clamping it to ground, SONY talks about a DC level. The ΦCLP pin serves this purpose. In this particular CCD sensor the clamping part is internal but the sample-and-hold section is done externally. The main board uses a Wolfong WM8143-10 CCD signal processor, integrates the analogue signal conditioning required by CCD sensors with a 10-bit ADC. It has the circuitry for sampling the signal and It even includes a section to implement Correlated Double Sampling with a clamp switch. This is probably for CCD sensors that don’t implement the clamping internally. 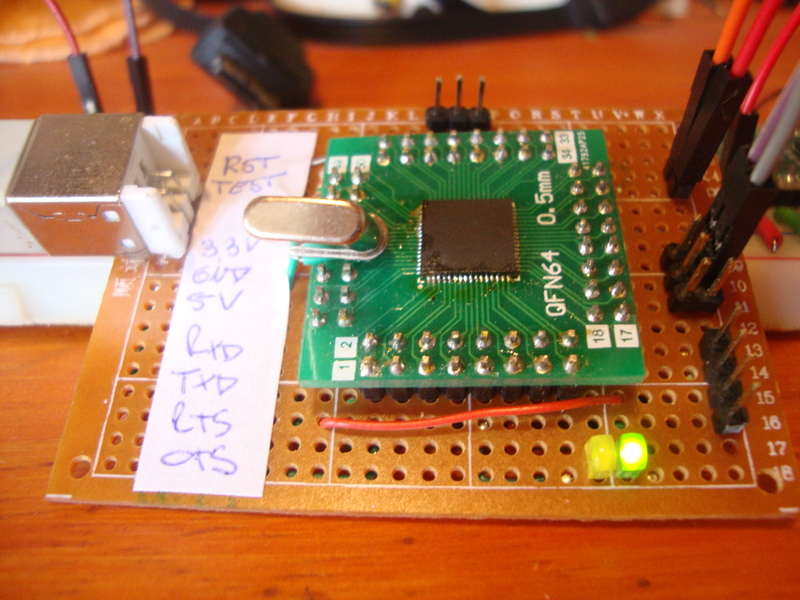 The next step It’s to hook up the CCD board to a microcontroller, replicate the driving signals and see what I get. I’m currently working at the Electronics and 3D Prototyping Laboratory at the Facultad de Ingeniería, Universidad Nacional de Entre Ríos. 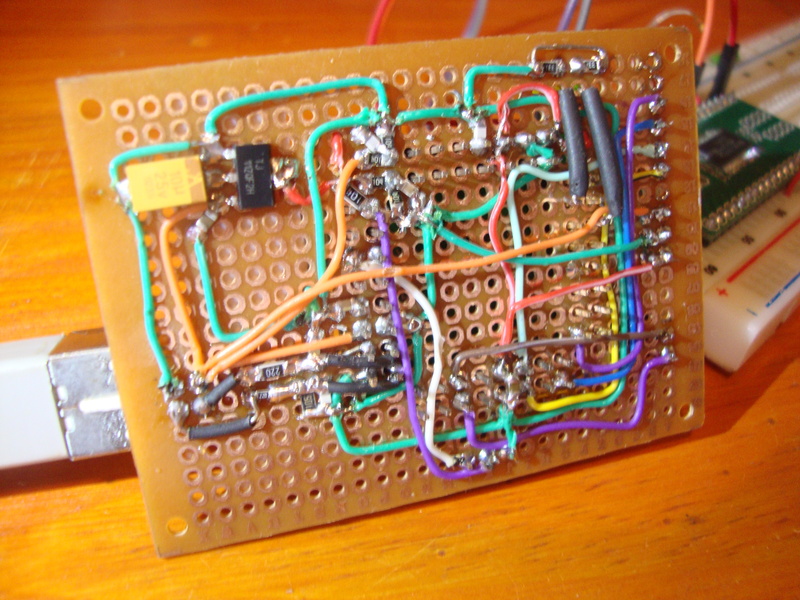 We are working on a biopotential amplifier based on a ADS1299. The amplifier uses 1.5mm touch proof connectors like this one. Unfortunately Plastics1 is the only manufacturer (and seller) of these particular connectors. The purchase have not been done yet, and it will take a while to have them in the lab. That was a problem as we needed to make some tests ASAP. We have a couple of 3d printers so we decided to make the connectors ourselves with the stuff we have in the Lab. 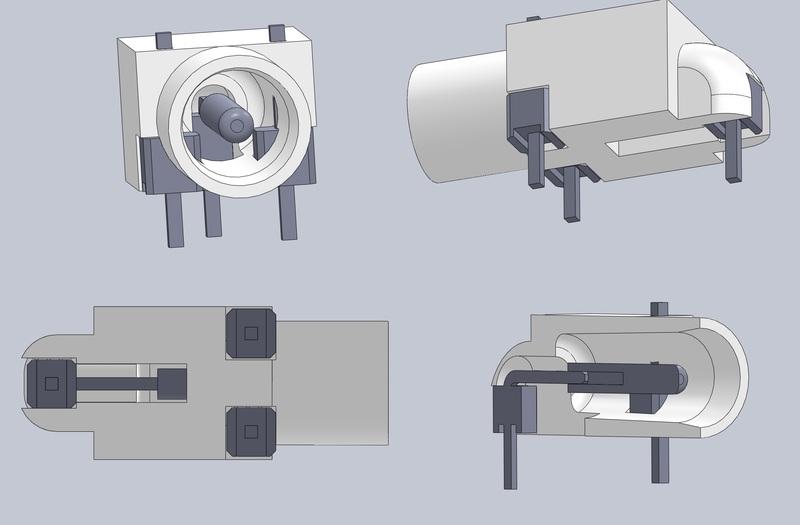 I had already made the connectors’ 3D model in Solidworks in order to generate the step an wrl files for KiCad. I modified the housing to fit standard 2.54mm pin headers. 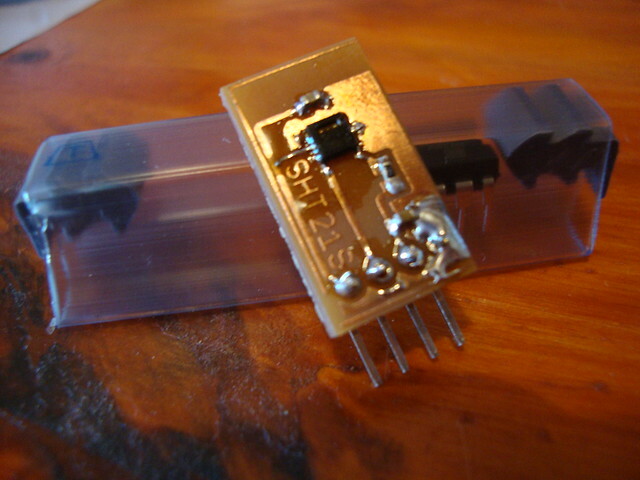 The main fear we had was that the printed plastic wouldn’t tolerate the heat while being soldered to the PCB. For that reason we didn’t use just the metal pins but also the plastic part of them. That material is designed to withstand the heat while being solder and was used to minimize direct metal-to-housing contact. 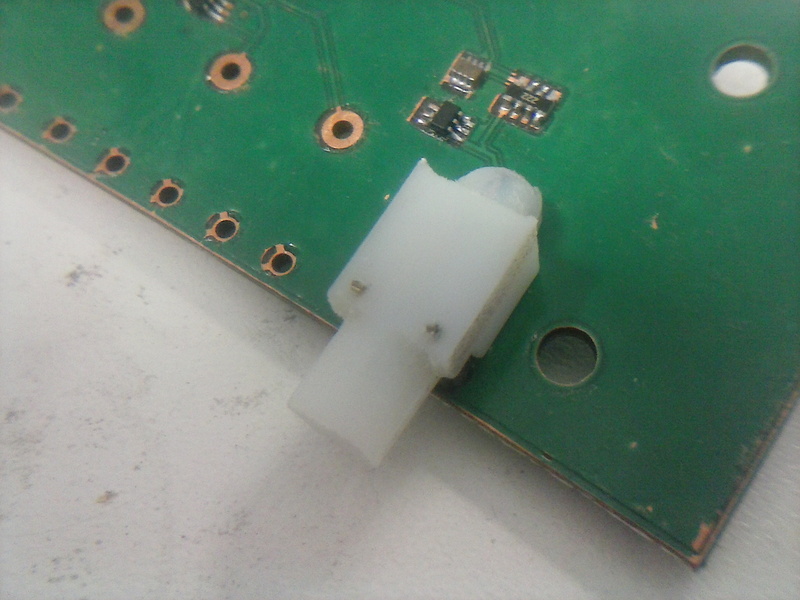 The pins at the front of the connector were soldered first to the PCB and then the housing was press fit into them. We printed the connector in a Objet Eden 260 from Stratasys. The material used is VeroWhite. We found out about a connector with pins in a similar size to the one we needed. Circular Plastic Connectors (CPC) use 1.58mm pins, close enough. We had a couple in the lab from another project but we needed more. Luckily my cousin (who is studying there as well) is working in a similar project for his thesis and bought a bunch of these pins to be used in a similar way. The pins were disassembled as seen in the picture and only the front part was used. .. and gluded in the printed housing. the connector was press fit into them and the central contact soldered. We made several connectors, they are not pretty but they work great. A few more PCBs, this time for Freescale’s sensors. 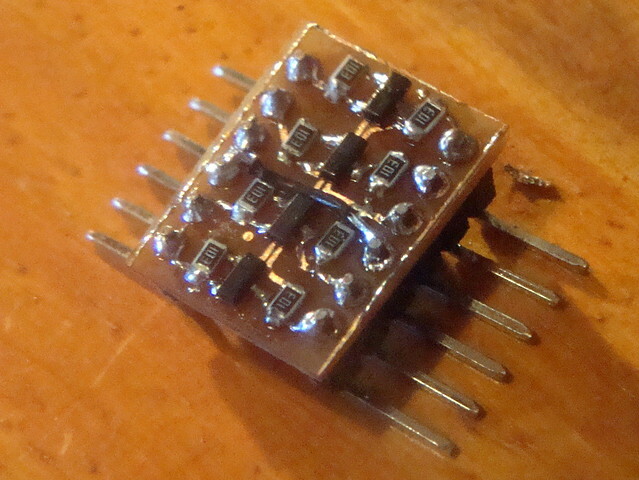 The MMA8451Q is a low-power, three-axis accelerometer with 14 bits of resolution. It communicates over I2C, has built in tilt/orientation detection and also tap detection. To make the PCB I downloaded the Eagle files from Sparkfun breakout board and modified it to make it single sided. I had to add a couple of 0 ohm resistors as jumpers. The FXOS8700CQ combines a 14-bit accelerometer and a 16-bit magnetometer. It also has some programmable acceleration event functions, like tap and orientation detection, and includes programmable magnetic event functions: Threshold detection, Vector-magnitude change detection, etc. 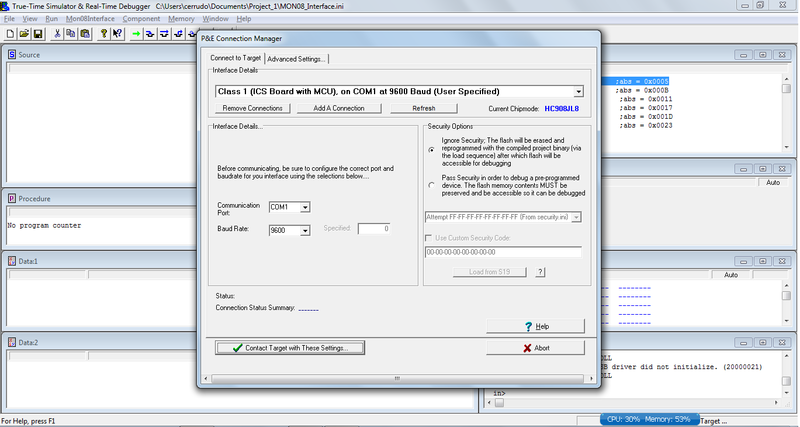 It can communicate using i2c or SPI. I used this library to test it. 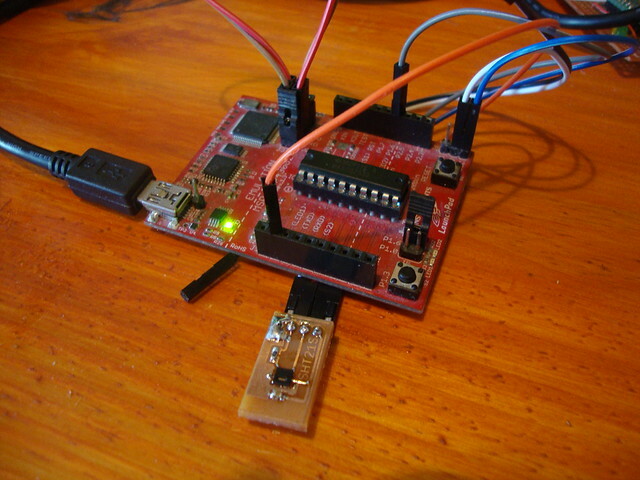 I also used Sparkfun’s Eagle files to make the board and I tested using Adafruit Library. According to Google Maps the height where I live is 64.13 m. I was testing the device on a first floor, I would say it’s pretty accurate. All this sensors are 3V devices. I tried first to connect them to a MSP430 Launchpad using Energia but I couldn’t make them work. 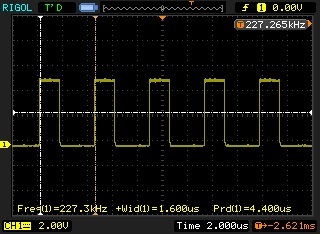 The I2C protocol defines a so-called repeated start condition. 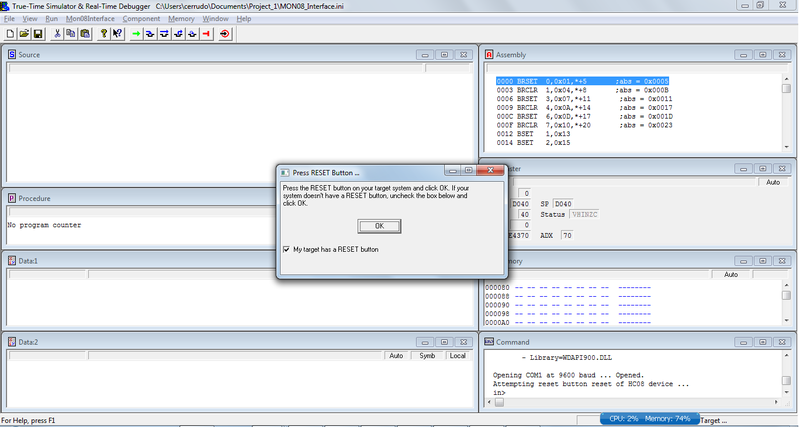 After having sent the address byte (address and read/write bit) the master may send any number of bytes followed by a stop condition. Instead of sending the stop condition it is also allowed to send another start condition again followed by an address (and of course including a read/write bit) and more data1. Freescales’s sensors use this Repeated Start command and as I found out, Energia doesn’t support it. As I don’t have any 3.3V Arduino I needed a logic level converter. 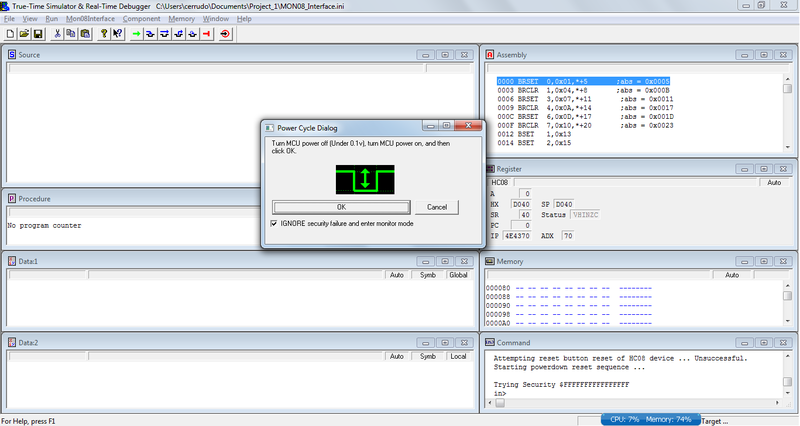 I downloaded Sparkfun files for their Bi-Directional Logic Level Converter and modified it to make it single sided. 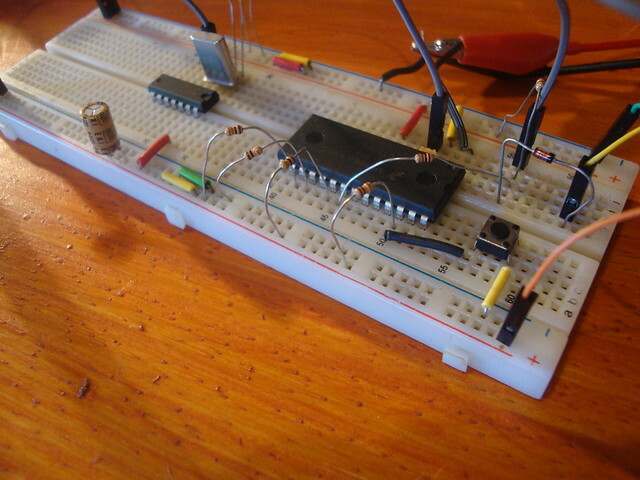 I used some 2N7002 transistors I had around. As requested, here is the file for the MPL3115A2 breakout board. It is based on Sparkfun board but I changed the connector pinout in order to make it easier to design a single sided PCB. Hace unos años (varios, unos 6….) conseguí por medio del programa de Muestras Gratis de Freescale unos micros de la linea HC08. Comencé a investigar de que forma programarlos, que interfaz de programación construir, que software utilizar, etc. En el proceso cambíé la PC de esctitorio con XP por una notebook con Windows 7. Esto trajo varios probemas: en primer lugar, leí en su momento que no iba a haber soporte del CodeWarrior (el IDE de desarollo de Freescale) sobre Windows 7, lo podía solucionar con una maquina virtual que corra XP, pero me parecía medio engorroso. Otro problema era la falta de un puerto serie en mi notebook. Tenía intenciones de utilizar la interfaz MON08 para la programación de los micros. Es una interfaz sencilla que requiere pocos componentes. Leí en su momento comentarios contradictorios acerca del uso de conversores Serie-USB. Así que los micros estuvieron juntando tierra todos estos años. Entre tanto Freescale (ahora NXP, si han habido algunos cambios…) dió de baja la linea HC08. Hace unas semanas me encontré de casualidad (no recuerdo que estaba buscando) con este post que explica como instalar CodeWarrior 6,3 en Windows 7 x64 bits. Seguí los pasos y en un rato estuvo andando sin problemas. Comencé luego a buscar información relacionada al uso de conversores USB y encontré un par de post interesantes. Uno donde muestra una placa de desarrollo para micros HC08 y utiliza un FT232RL. Y otro donde se muestra un programador para micros HC08, de la familia JL y JK, y utiliza un conversor MCP2200. Este último usaba como software de desarrollo WinIDE. También encontré este video en el que utilizan un conversor PL2303 para la programación de un micro HC08, expecíficamente un QY4. En este caso se usa CodeWarrior 6.3 en una máquina virtual y por algún motivo menciona que el puerto virtual creado debe ser el COM1. Otro problema era la dificultad de conseguir donde vivo un cristal de 9.8304MHz, aunque según este post sería posible utilizar cristales de frecuencias cercanas y más fácil de conseguir, como por ejemplo 10MHz. Comencé con unas pruebas sencillas en una protoboard. Armé el circuito que se muestra en el esquemático, para los 9V necesarios para entrar en modo programación (Normal Monitor Mode) utilizo una fuente externa. El microcontrolador es un MC68HC908JL8 y el oscilador es de 10 MHz. Acá se puede ver el circuito armado en una protoboard. Las primeras pruebas las hice con un PL2303. El conversor tenía asignado el COM44 y el software de programación no lo reconocía. Luego lo cambié al COM1, elegí un baudrate de 9600 y como interfaz la Clase 3. 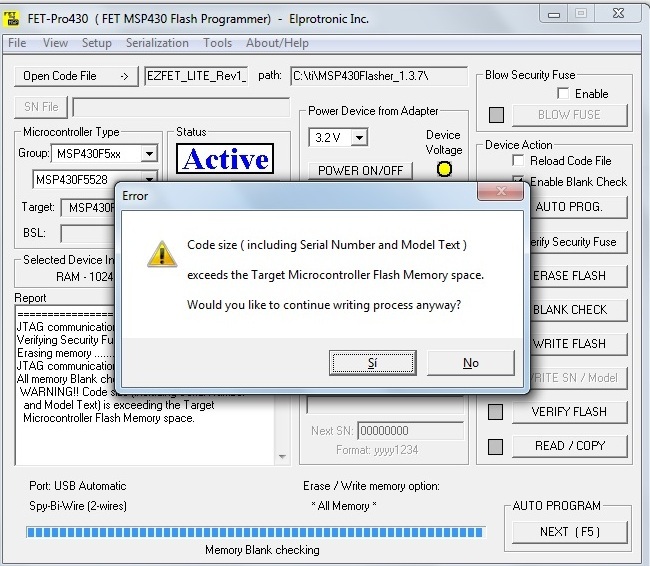 El apagado del micro es necesario para pasar el chequeo inicial de seguridad y acceder a la memoria flash del microcontrolador. Un simple reset no es suficiente; para pasar la verificación de seguridad es necesario forzar al procesador a pasar por un POR (power-on reset)1. Cambié el conversor Serie-USB. Utilicé un FT232RL soldado en una placa adaptadora que me permite acceder al pin DTR. Es posible instalar y utilizar CodeWarrior 6.3 en Windows 7 x64 siguiendo estos pasos. 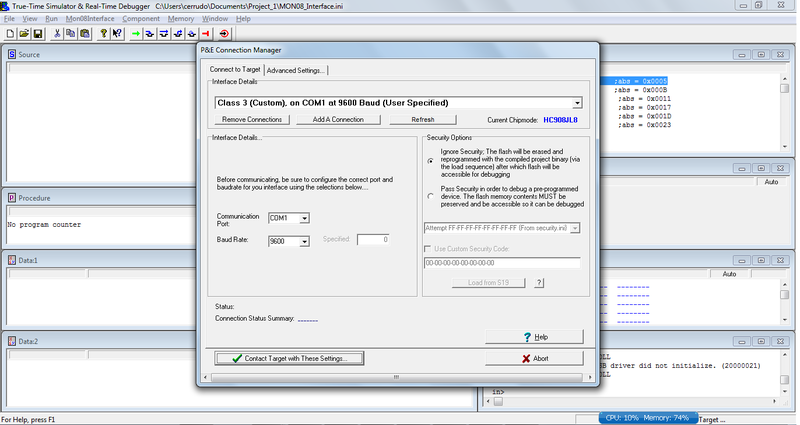 Es posible programar dispositivos HC08 con conversores Serie-USB con CodeWarrior 6.3 en Windows 7 x64. Es posible utilizar un cristal de 10MHz. Another small board, this time for a INA219. 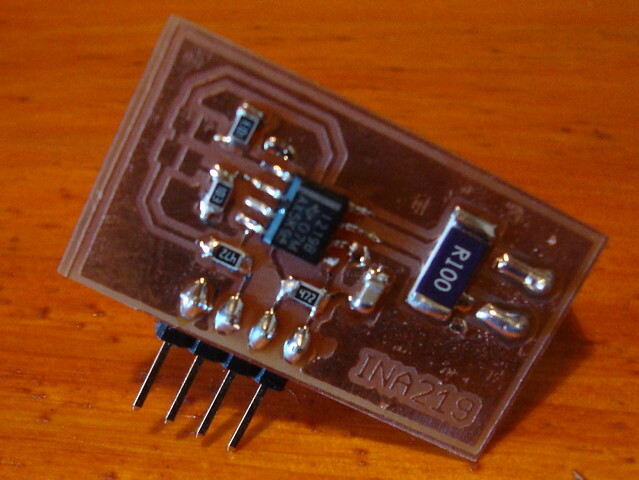 The INA219 is a high-side current shunt and power monitor with an I2C interface. The current measurement is slightly off. I need to play a litlle more with the calibration routines. 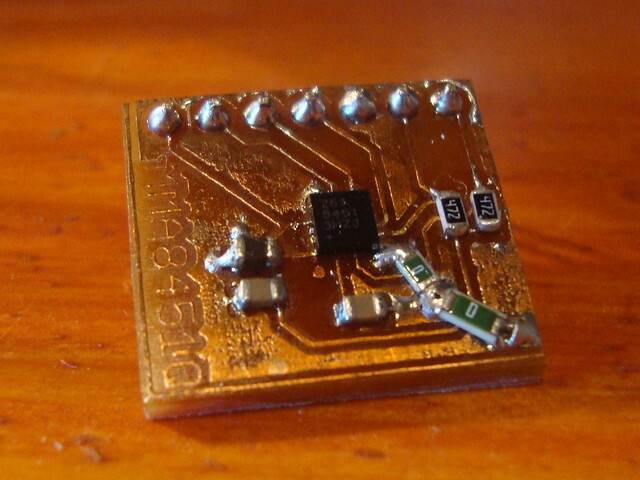 I made a little board for a SHT21 humidity and temperature sensor from Sensirion. There are several versions with I2C interface, PWM output and SMD/analog interface. I’ve got the one with Sigma Delta Modulation (SMD) output, is a bit-stream of pulses; the more high pulses the higher the value in the full measurement range. 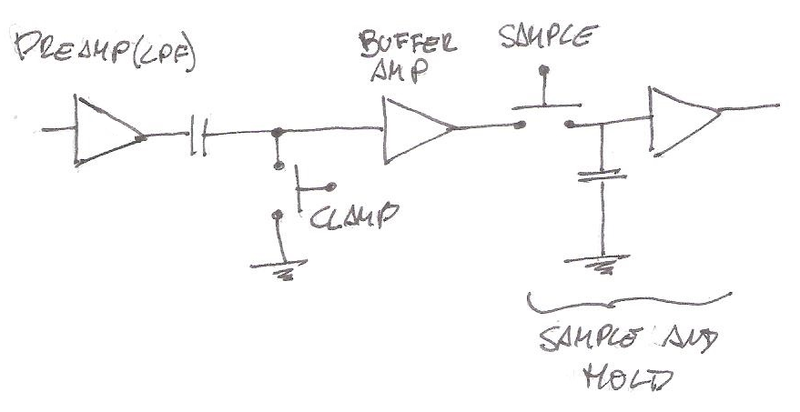 A low-pass filter convert the pulse stream to an analog voltage signal. It has a control pin (SCL) to select between humidity or temperature output. SCL high yields humidity output, SCL low yields temperature output. 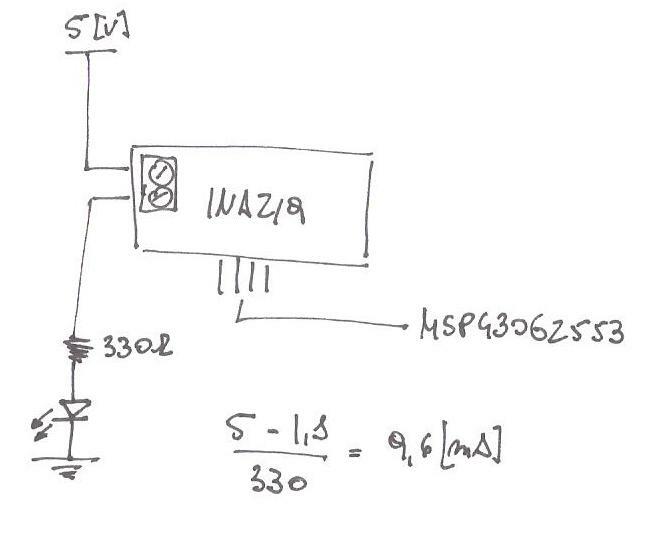 I made a simple sketch in Energia to test it out using an MSP430G2553. P1.6 selects between humidity or temperature and P1.0 is used as the ADC input. 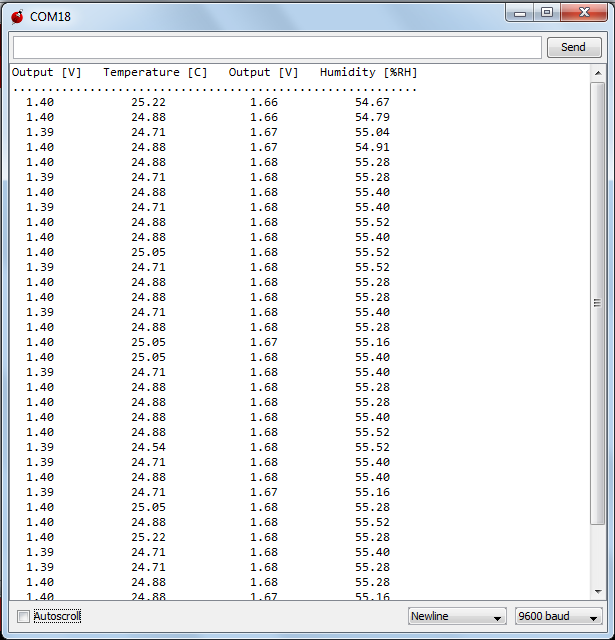 …and logged both temperature an humidity. 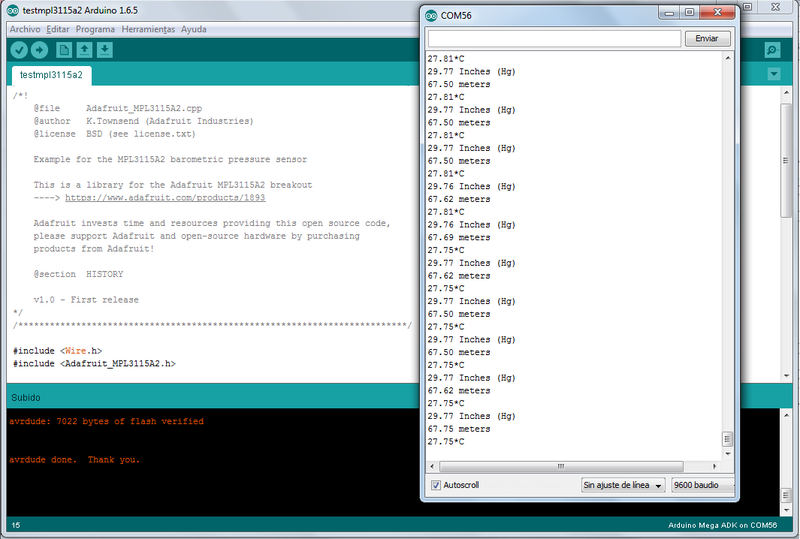 I have a few MSP430G2955 around but non of my Launchpads are capable of programming this MCU. 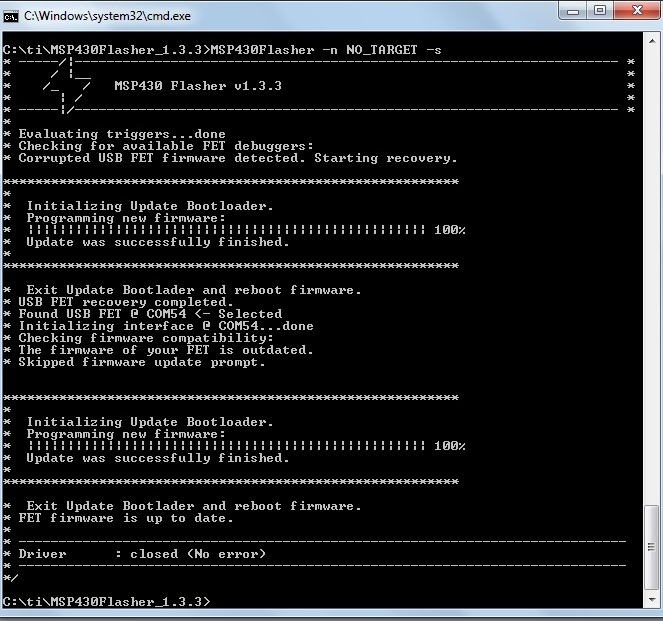 Texas Instruments released a while back all the informtation needed to build the new ez-FET lite. 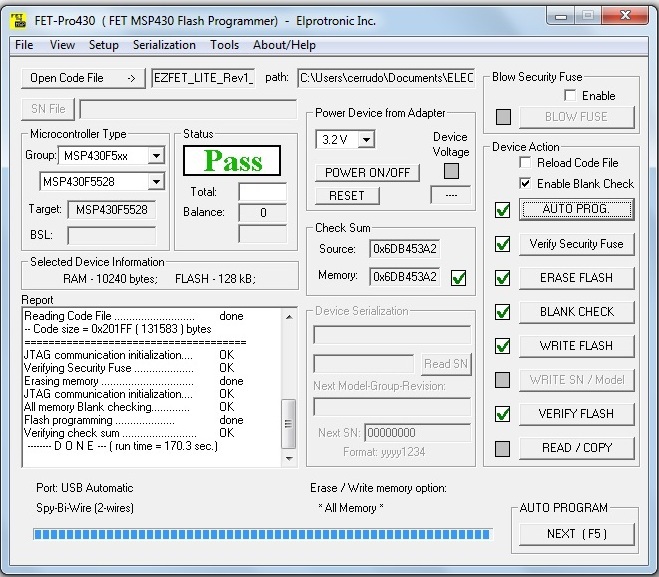 The eZ-FET lite is a low cost USB-based on-board emulation solution for MSP430 microcontrollers. This debuger supports all MSP430 devices compatible with SBW programming and I could use it to program the MSP430G2955. 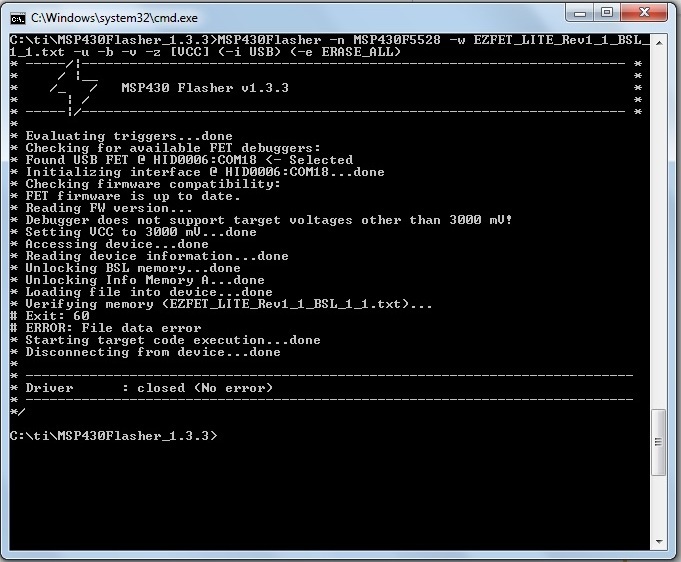 According to this post the error might be caused by the the custom BSL portion of the ezFET firmware being not properly flashed. 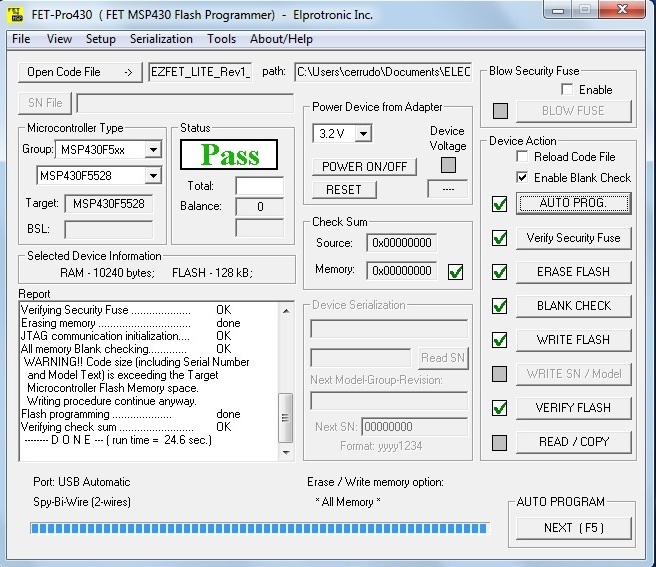 I did read this other post in 43oh about flashing the firmware with MSP430Flasher, I just wanted to see if the Elpotronic software would work. 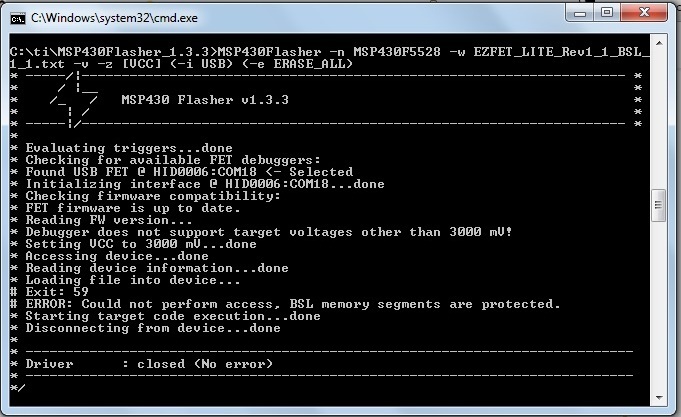 I tried to re-program the MSP430F5528 using MSP430Flasher but I get this “BSL memory segments are protected” error. 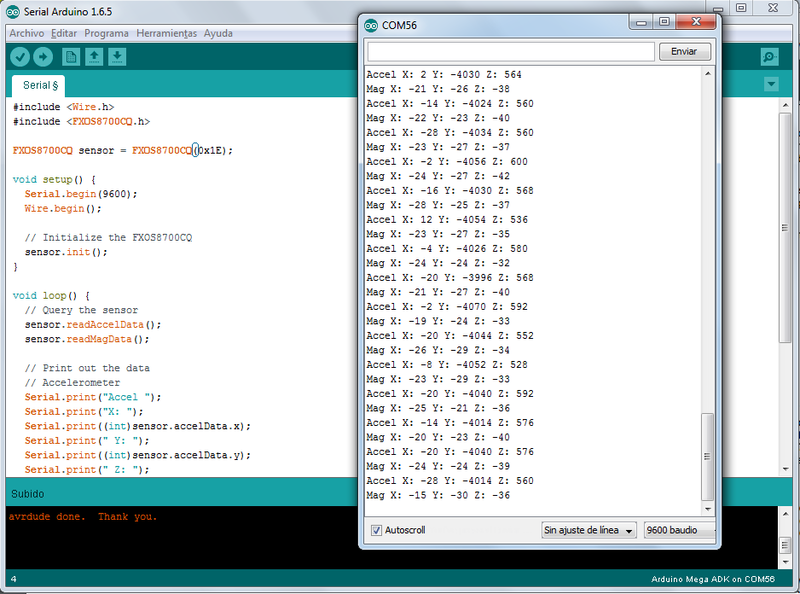 Anyway, I tested the programmer with the old and beloved “blink” and It’s working. 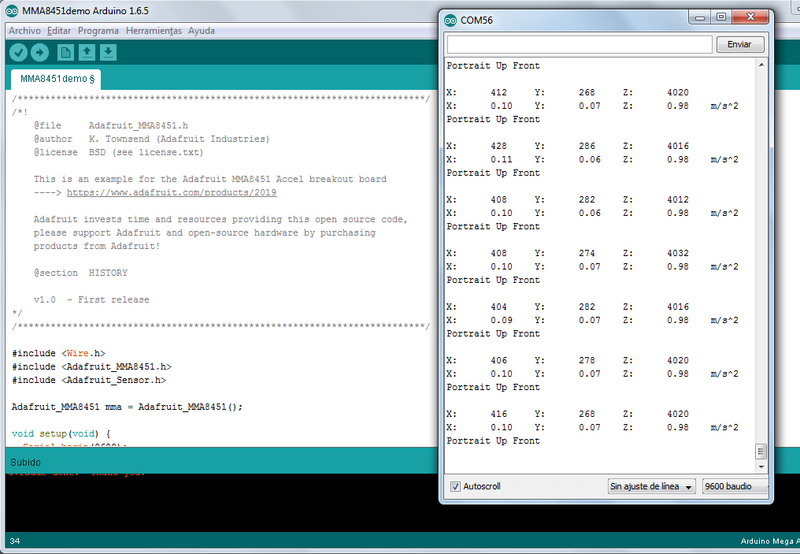 I still need to test the UART interface but this should work as well.